The editors divide the volume into three sections. First, if American Pentecostals trace their roots to Topeka, Kansas, and the Azusa Street revival in Los Angeles, California, numerous essayists suggest that Canadian Pentecostals must own their unique origins. According to Adam Stewart, author of Handbook of Pentecostal Christianity, the Hebden Mission in Toronto represents the polygenetic origin of Canadian (and global) Pentecostalism; in other words, a movement not linked exclusively to mythical origins under the leadership of Charles Parham and William Seymour. Similarly, Randall Holm articulates the specific character of Pentecostals from Winnipeg. Emblematic of a prairie worldview, Winnipeggers embody a mythos where hard work, discipline, and slow progress trump speed, immediate success, and the razzle-dazzle of American (and, for that matter, eastern Canadian) religion. Second, four essays devoted to the tumultuous journeys of Zelma Argue and Aimee Semple McPherson highlight the success and struggles of female evangelists/missionaries. Though these and other women experience proto-egalitarian impulses based upon charismatic empowering, they must navigate through various restrictive biases against women and rising institutionalization. In the final section, essayists address two highly controversial issues: (1) David Reed and Shane Flanagan demonstrate the monumental role of Canadians such as R. E. McAlister, Franklin Small, and John Paterson in the expansion of the larger Oneness controversy; and (2) contributors William Faupel and Mark Hutchinson tackle the Latter Rain movement in North Battleford, Saskatchewan. Though some might suggest that the Latter Rain movement of the late 1940s produces minimal enduring impact, Hutchinson argues persuasively for its historical, theological and liturgical (worship/music) influence upon various expressions of the burgeoning Charismatic Renewal. As a Canadian living in the U.S., I find myself fascinated by a number of themes that lie beneath the surface. First, even if Canadian and American Pentecostals develop unique identities, they remain intricately connected. The border between the two countries surely does not reflect the contemporary border struggles between the United States and Mexico; instead, evangelists, pastors and lay folk travel “across the line” with incredible freedom and regularity. What results is not a story of Pentecostals from the nation to the north, but one filled with significant mutual influence. Second, while Canadians often lament the brain drain of some of their best young Pentecostals who provide ministry in the United States, many of these Canadians do not lose sight of their roots. Nowhere is this more apparent than in the revivals under Sister Aimee, founder and pastor of Angelus Temple in Los Angeles, yet evangelist to the north. Michael Di Giacomo recounts the stirring story of McPherson’s revivals in Quebec and their critical role for the rise of Pentecostalism in Quebec. I cannot overstate the importance of this volume. This is a must read for Canadian Pentecostal pastors, students and educators. Pentecostal historians should consider this as a textbook for courses on Pentecostal history at our confessional schools. Further, non-Pentecostal historians and theologians at Canadian universities and seminaries must move beyond Canadian histories focused primarily on Catholic and Protestant stories and engage the socio-cultural diversity of religion in Canada. Whether sympathetic to Pentecostals or not, students should experience the larger picture of Christianity in Canada; specifically, a tradition no longer relegated to the fringes of Canadian society and culture. I would also recommend this work for a similar audience among American and global Pentecostals. Readers outside of the Canadian Pentecostal constituency will experience a wonderful story of God’s activity in a multicultural context; in spite of the plethora of recent Pentecostal histories from around the world (Africa, Asia, and Latin America), the Canadian story remains virtually unknown. 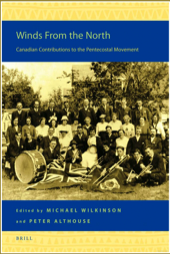 Though the story is by no means complete, I trust this collection will serve as an inspiration for much needed development on regional Canadian Pentecostal histories. This includes not only provinces addressed in this volume, such as Manitoba, Saskatchewan, Ontario, and Quebec, but also Alberta, British Columbia, the Maritimes, and northern communities that receive little or no attention in this volume (indeed, this may prove to be a legitimate gap in this volume and surely not lost on readers from these regions). Readers familiar with the effects of the cold winter winds from the north will feel here a different wind, one that blows where it wishes and brings times of refreshing. As we continue to write the story of the past, may we remain ever sensitive to the current wind of the Spirit! 1 I do not wish to undermine earlier popular histories such as Gordon Atter’s, The Third Force (Peterborough: College Press, 1962); Gloria Kulbeck’s What God Hath Wrought: A History of the Pentecostal Assemblies of Canada (Toronto: The Pentecostal Assemblies of Canada, 1958); and Thomas Miller’s Canadian Pentecostals: A History of the Pentecostal Assemblies of Canada (Mississauga: Full Gospel Publishing House, 1994). However, the work under review reflects a recent surge to engage the academic community in a manner beyond those of previous generations. Martin William Mittelstadt (Ph.D., Marquette University) is an associate professor of New Testament Evangel University, Springfield, Missouri.